Cisco released its updated Visual Networking Index "VNI," forecasting that mobile video traffic will increase 14-fold from 2013 to 2018 and will have the highest growth rate of any mobile application category. By 2018, mobile video will represent 69% of global mobile data traffic, up from 53% in 2013. Mobile video will account for more than 6 times as much mobile traffic as mobile web/data (11.7%), the next highest category. By region, the Middle East and Africa will have the highest percentage of mobile video traffic (76%) in 2018 with the highest growth (84% CAGR). Interestingly, North American will have the second-lowest mobile video traffic percentage (67%) and the slowest growth rate (56% CAGR). Cisco’s analysis also found that mobile video applications have a "prime time" in that they are predominantly used during certain times of day. While web usage tends to occur throughout the day, mobile video consumption is highest in the evening. Busy hour mobile traffic is growing at a slightly higher pace than average hour traffic, and by 2018 mobile busy hour traffic will be 83% higher than average hour traffic, compared to 66% in 2013. Cisco notes that tiered data monthly plans from mobile operators have had an impact on consumer behavior since many viewers tend to wait until they connect to WiFi to watch video, rather than use up their mobile data. Although tiered pricing has been shown to affect consumer behavior, Cisco said it has not affected its forecasted growth of mobile video usage. More broadly, Cisco forecasts overall mobile data traffic will increase almost 11-fold over the next four years, reaching 18 exabytes per month. Total projected annual data traffic by 2018 will be 190 exabytes, a CAGR of 61% from 2013. 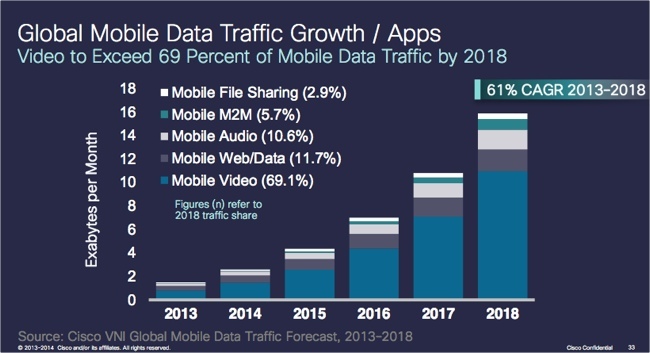 Cisco said that in addition to increased mobile video usage, other factors driving overall mobile data are continued growth in users, devices and connections. By 2018, global mobile traffic growth will outpace global fixed traffic growth by 3x. The number of mobile Internet connections will exceed 10 billion by 2018 and be 1.4x greater than the world’s population. Mobile users will reach 4.9 billion in 2018, up from 4.1 billion in 2013. Cisco’s report, the "Visual Networking Index Global Mobile Data Traffic Forecast Update 2013-2018", relies on the company’s analysis of real-world mobile data usage studies as well as its own estimates. The forecast is available here.